The recommended production configuration for Broadleaf is to use a CDN for serving static assets. CDN stands for Content Delivery Network. There are many commercial providers for CDNs. This guide will explain how to configure one such provider (Amazon Cloud Front). Other CDNs would follow similar configuration steps. CDNs provide caching of your images and static assets closer to your end customer (also called "edge caching"). This results in higher overall performance of your application and less load on your Broadleaf application and web servers. What type of CDNs does Broadleaf support? Broadleaf provides a dynamic image server. A benefit of this is that you can upload one high resolution image with your products (or other content types). This image can then be dynamically resized. For example, you might show a small "thumbnail" version of the image on your cart page and a "mobile optimized" version of the image for users browsing by phone. By default, Broadleaf does this image manipulation the first time an image is requested. Because of the dynamic image capabilities, Broadleaf requires a CDN that supports an "origin" server concept. This means that the first time an image is requested, the CDN will check the "origin" server (in this case, your Broadleaf application) to get the image. Future requests will be handled by the CDN without talking to Broadleaf. Note for more information on image manipulation, see the Asset Server section. It is useful to understand how an image requested by a browser is typically served through Broadleaf. 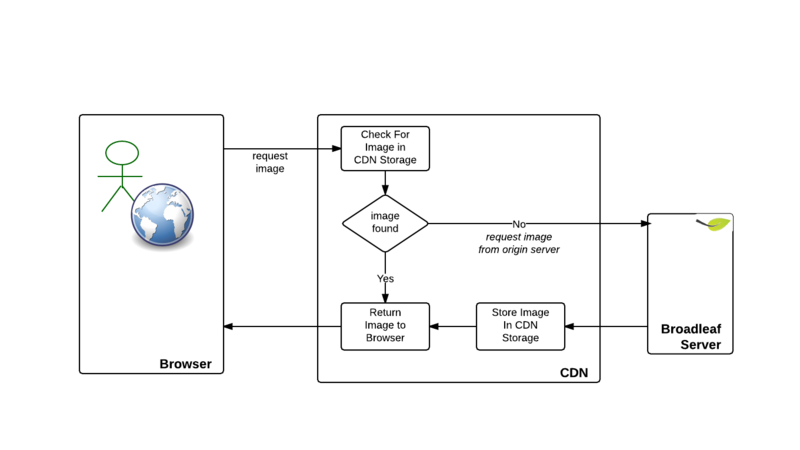 In the above image, the browser requests an image from the CDN. If the CDN has the image then it returns it. If not, then it asks for the image from the "origin" server which in our case is Broadleaf. 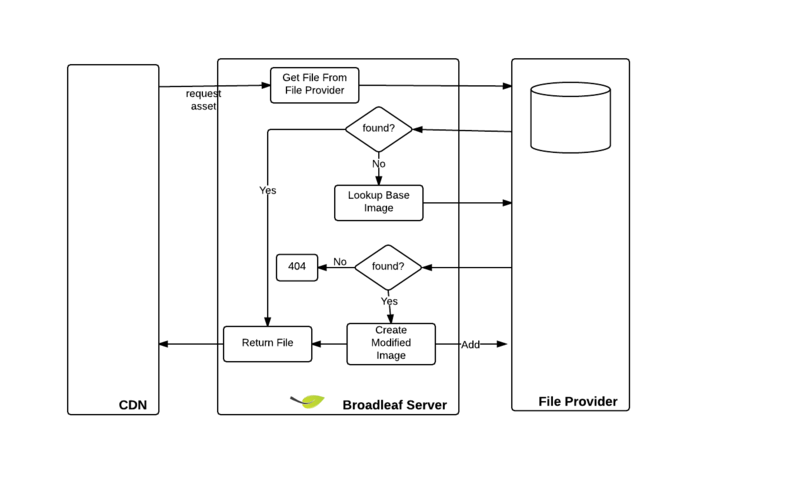 When a CDN requests an image from Broadleaf, Broadleaf must load the image from a FileProvider and possibly manipulate the image before returning it to the CDN. The following diagram outlines this process. Note that the default Broadleaf FileProvider uses the file system and assumes that the file location is set to a shared network drive for distributed systems. It is also possible to use the database, Amazon-S3, or Rackspace-CloudFiles as your file provider. Broadleaf relies on a few properties to configure CDN setup. # that should be served by the CDN. Steps to provision a CDN vary by provider. Here are steps for setting up Amazon Cloud Front to work with Broadleaf. These steps assume you have an Amazon AWS account and were valid as of September 3, 2014. Step 1 : Access the AWS management console. (console.aws.amazon.com). Change the forward query strings from the default of Yes to No. This is important in order to use broadleaf's dynamic image manipulation capabilities. Follow the instructions on the distribution settings to provide a custom image domain (e.g. static.mysite.com) instead of using the default *.cloudfront.net URL for your images. In your page templates, you need to use "blc:src" in order to have the URL's rewritten for use with the CDN. Broadleaf provides a UrlRewriteProcessor that rewrites assets created through the Broadleaf admin. The processor manipulates the "src" attribute of any item whose source starts with "/cmsstatic/" replacing it with the values configured by the asset.server properties defined above. Using a CDN can greatly reduce the hardware and network requirements in the Broadleaf infrastructure and improve overall end user performance through page load times.